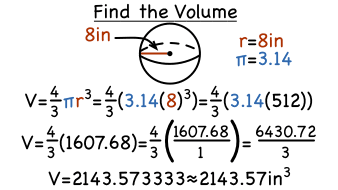 Want to find the volume of a sphere? If you know the radius of the sphere, you can simply plug that value into the formula for the volume of a sphere and simplify! This tutorial shows you how! Every played with a bouncy ball, a volleyball, a basketball, or a baseball? Those are all spheres! Check out this tutorial to see what defines a sphere and learn its different parts. Take a look! Trying to find the formula for the volume of a sphere? Then check out this tutorial! You'll see how to use a cylinder with the same dimensions to find the formula for the volume of a sphere. Take a look!